Chennai: Day Two. India always smells like its a little bit on fire. Despite that it takes almost no time for me to feel comfortable and grounded here. A nice brief yoga and meditation this morning was exactly what we needed. Back in our room I decide to test the limits of our electrical converter by drying my hair. Less than one minute in all the power shuts down. I say a tiny prayer that it is just our room and not the wedding halls and restaurants also on the property. Prayer is answered, it is just our room. At 11 am we were to meet in the lobby for our first group excursion. We walked to the lobby at 10:50. No one else was there. We waited 5 minutes and decided to head to the bus. On our way to the bus we spot a few members of our group heading toward the lobby. Then a couple more came by and informed us we were to meet in the lobby. We headed back to the lobby where Swami Divyananda asked us to turn around and please board the bus. Third rule if India: Everything is subject to change and probably will. Once on our bus we were informed of the rules of respect. Women were to where three layers on their top halves; undershirt or bra, shirt and scarf. We, all of us, are to eat with our right hand only. The left is used for everything else. EVERYTHING ELSE. If you’re curious what everything else is private message me. At lunch we made our formal introductions. Among us are counselors, professors, social workers, architects, acupuncturists, body workers and of course yogis. It is so interesting to me what we choose to share about ourselves. Inside of two minutes we have the opportunity to create our identities and share what we feel is important about us or to us. The truth is there is no need for these formal introductions, we all find our energetic matches somehow. And in this case, at some point in our pasts, either this life or a previous one, we made an agreement to reconnect. And so we are all here together. There is a certain comfort level in a group like this, an understood familiarity. Maybe it’s just me, but I don’t think this is something I could feel alone, it’s a shared experience. Beyond the formal introductions we chat amongst ourselves asking more about whatever information was shared as fodder for conversation. We share a 17 course meal. At least. Each morsel of food is presented separately and takes so long that we must abandon dessert for our next appointment. 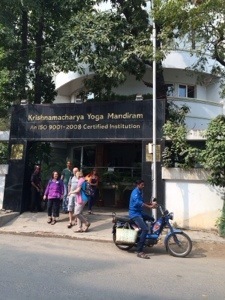 Onto the Krishnamacharya Yoga Mandiram where we learn more about Patanjali and yoga therapy, then we’re off for retail therapy. Educated now on the proper attire for women we are cut loose in a mall eleven stories high, five of which included stores open to the public. It was a labyrinth of mainstream-ish type clothing stores, darkened hallways filled with Marrakech style stalls and over-eager shop owners luring unsuspecting tourists in to view their wares. Having been caught by the nice gentleman inviting us in on our last trip to India, we chose to shop a little more mainstream. Purchases in hand we boarded the bus and headed back to the hotel. Settling in at the Krishna restaurant for a nice cup of chai, actually two – that second one being a mistake – and a little dinner, we are joined by a handful of members from our group. A couple have known each other, others have just met, yet all are familiar. We share a meal and reflections from the day, chat about this and that like old friends, then part for our respective rooms. It is time for bed. Except for that second little tiny cup of chai.